Startup Grind offers attendees the chance to hear more than 100 of today’s most successful founders, leaders and VC partners tell their origin stories. In previous years, Airbnb Co-Founder Joe Gebbia, SoulCycle Founder Melanie Whelan, and Stripe Co-Founder and President John Collision, have taken the stage to share their advice for new founders. Still curious about Startup Grind? Check out our recap of the 2019 event. Once a year, 12,500+ SaaS executives, founders, and VCs come together for SaaStr Annual, the largest non-vendor SaaS conference on the planet. With sessions covering everything from “Five Qualitative Factors VCs Look for in a Series A Startup,” to “The Audacity to Lead: Inclusivity and Diversity in Leadership 101,” attendees can build a two-day agenda covering the A-Z of leadership. We were there! Take a look back at SaaStr 2019. The premiere conference for creative entrepreneurs, Alt Summit takes over five stylish locations across Palm Springs for six days of classes, workshops, panels, and networking events. Sessions and conversations range in topic from branding, to business mentorship, to balancing your work-life schedule. 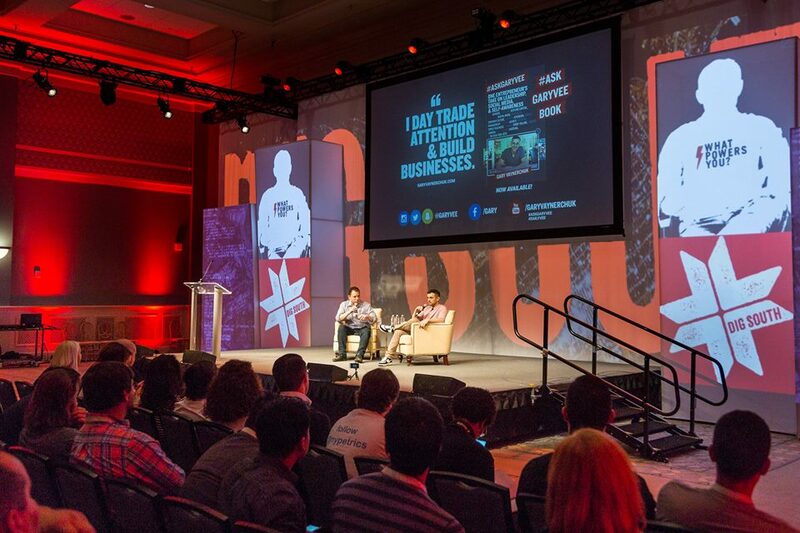 Dig South focuses on the fast-growing tech industry in the US’s southern states, giving the stage to speakers from the leading edge of technology, business marketing, culture, and the digital economy. Previous speakers include Gary Vaynercuck, Casper CEO Phillip Krim, and Kickstarter CEO Yancy Strickler. If you go: Be sure to see cred speakers from 3Q Digital, Greenbrier, PacePR, Sharethrough, and AnyRoad take the stage. Culture Summit is a three-day conference that approaches building culture from the bottom up, with the motto “you have the power to build the culture you want to work in.” Attendees can expect to learn about the latest trends and tools to build a better culture from end to end, with actionable insights, tips, and strategies that attendees can take back and immediately implement. The real-life version of one of the startup world’s most popular websites and daily newsletters, HustleCon is a one-day event where the world’s most successful non-technical founders share their personal stories. With one track running throughout the day and an intimate, curated list of speakers, attendees can expect a lively, highly focused day of conversation. Is it June yet? : We’re counting down the days until HustleCon 2019. Until then, take a look at our recap of 2018’s San Francisco event. Held in conjunction with the MAHA Music Festival, Big Omaha celebrates the ideas, energy, and passion that go into each business. This one-day festival provides everyone from CEOs to creatives the platform to engage, connect, inspire, and be inspired by speakers including Tinder Co-Founder Jonathan Badeenand Alice Co-Founder Elizabeth Gore. After the conference, stay for the two-day music festival, where previous attendees caught performances from TV on the Radio, Tune-Yards, and Ravyn Lenae. An annual marketing event hosted by HubSpot, INBOUND gathers brand leaders and marketing experts to share the challenges and successes of connecting with B2C and B2B customers. INBOUND strives to bring people together, no matter their department, so that their brands—and their businesses—can grow better, faster, and more sustainably. With previous speakers including Glossier CEO and Founder Emily Weiss, Y Combinator Co-Founder and Partner Jessica Livingston, and Salesforce CEO and Founder Marc Benioff, Disrupt is where the startup world gathers to see the present and the future of tech in one place. Attendees can expect to hear from today's leaders and tomorrow's best startups, learn from industry analysts sharing their business expertise, witness the latest innovations, and connect with up-and-coming founders. Attendees will gather with more than a thousand other innovators, change-agents, founder and senior leaders from across the globe seeking new ideas on how to drive change and solve complex problems and improve the way you work and lead.